It is definitely no hidden secret that I love to style with bottles; I love them because they look so elegant and can make any nook or corner look layered with much beauty. 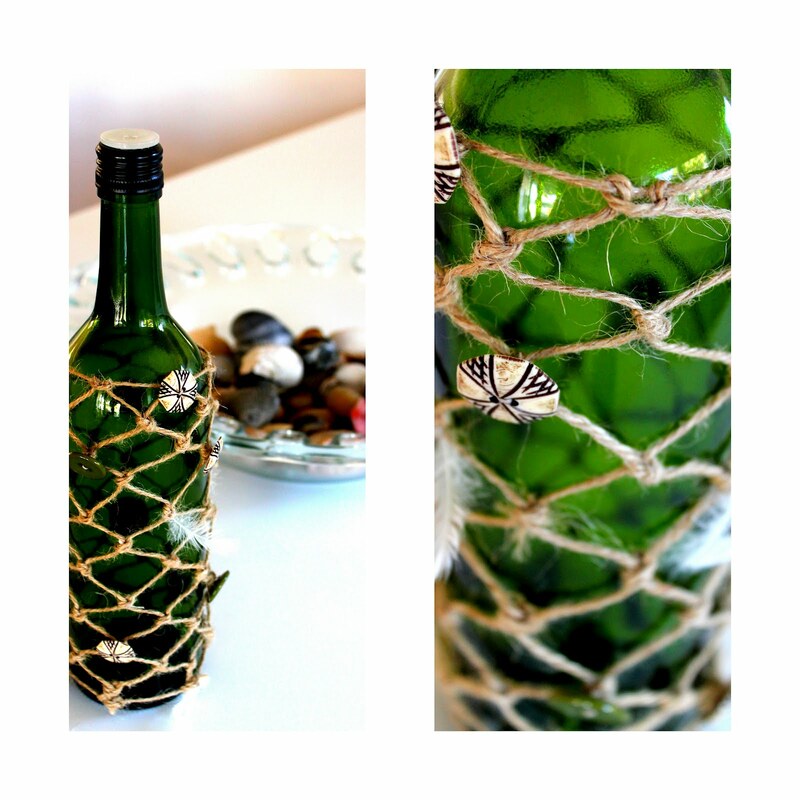 I was out to dinner recently and spotted a traditional style fisherman's bottle at a restaurant, it was loaded with memories of all things coastal, beachy and old and ever since I have wanted to do my own version of a DIY fisherman's bottle. I found this particular DIY thoroughly enjoyable because it is super simple and took no time at all to do! Make net style knots to create a fisherman's bottle holder. Wrap twine around your bottle, just below the neck and knot tightly. I did a double knot and snipped the ends off. Repeat this step for the base of your bottle too. This knot will eventually be hidden so do not worry too much about how it looks. Using your twine doubled over in a loop, measure 2x the length of your bottle and snip. You will need to cut 6 of these double lengths! Using slip knots, attach your 6 x loops to the twine around the neck of your bottle as seen below. Space these evenly around the circle/ neck and try to hide the original double knot if possible. Based on a net style knot, using one strand of twine from each knot (yes you want to split them apart) join it to a single strand directly next to it and complete a double knot. Continue doing this evenly around the entire neck of your bottle. You will see that you are forming little diamond shapes. Continue down the length of your bottle! I joined my last series of knots to the base twine using slip knots and a figure 8 knot to finish off. and Shabby Creek Cottage, Scandi Coast Home and No Minimalist Here. Thanks Guys! Oh, I am so excited you showed us how to do this!! I can totally try this! it is really neat! Thank you for stopping by! Thanks Sherry. Its a lovely fun tutorial this one, so easy and almost relaxing to do. Thanks Megan, lovely to meet you and thank you for dropping by! This is so neat! I really got to give this a try. I definitely like the way your turned out. Thanks for sharing! Thanks lovely ladies, glad you like! Wow, this is brilliant! Thank you so much for sharing this at my Say G'day Saturday party. I have featured this wonderful idea today on my blog. PS Isn't it great to finally see some sunshine! PPS I shared this on Facebook. Just popping over from Natasha in Oz's blog. Your newest follower, another Brisbane blogger.